Every once in a while I dive into a more recently released game in my backlog. This whole season of Rogue’s Adventures is mostly made up of games released in the last few years, and The Banner Saga is the second most recent game I’ve played and written about since Shadowrun Returns last year (which was backlogged for all of a few weeks). 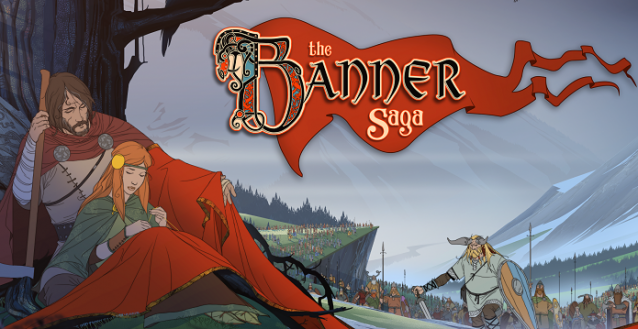 The Banner Saga was part of the original wave of Kickstarter games in 2012, alongside the likes of Broken Age and Wasteland 2, and benefited greatly from that initial excitement and draw to the crowdfunding platform. It was also one of the few games I didn’t actually back (along with Shadowrun Returns, ironically) in my attempt to be choosy when picking my supporting projects. The Banner Saga was a first indie project from a new studio (broken off from BioWare’s MMO division) and the gameplay structure seemed a bit confusing. But the hand-drawn art style was beautiful and I’m always up for a game with tactical turn-based combat – thus The Banner Saga remained on my radar for years until finally picking it up on the last Steam sale. If I had to describe The Banner Saga in a single ‘elevator pitch’ sentence, it would be: An apocalyptic Oregon Trail with life and death choices, tactical combat and RPG stats wrapped up in a unique fantasy world based on Norse mythology.